Modest Gym Outfits. Wearing right clothes for workouts is as important as going to the office in the proper official dress. It is an essential part of achieving your success goals and headstrong motivation to go on with the desired gym workouts. Here you might find it quite confusing about what to wear that feels super- comfy as well as stylish too while going to the gym. These outfits are not just restricted for hijabis or Muslim women but for all ladies out there who believe that true beauty lies in modesty. If you are going to shop for perfect outfits for your gym routines which are comfortable, stylish but modest too, you might be left with very few options to shop! Mostly you would find tight leggings, strapless sports bra and compression shorts. If you need help in selecting the right bra, here are 15 Great Bras To Wear. Whether it be for religious or moral reasons, or maybe just because you are not comfortable in revealing your body, buying modest gym wear with stylish and rightly fitted dress design would be a bit tricky option. While looking for perfect gym wear ideas with a modest look, there are various things that you must keep in mind. You must opt for buying quick- drying synthetics or lightweight fabric for gym wear instead of instead of moisture absorbing cotton material clothes. As the cotton fabric would become too much damp and may cause irritation and discomfort, the moisture-wicking fabrics are specially designed to keep the moisture away and evaporate eventually. Here are some smart yet practical ideas for modest gym outfits. 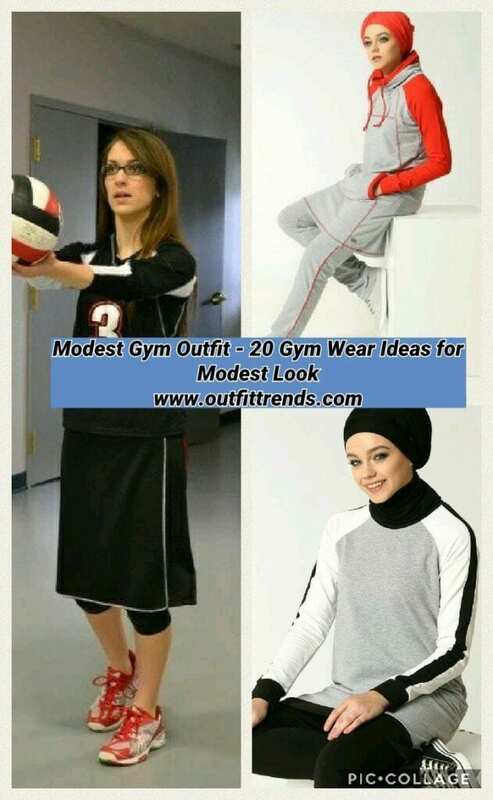 This simple yet stylish Hijab gym wear is the best ever modest gym outfit option that you can have! The fitted tights and tank top will feel much comfortable while burning up the sweat. Along with this, a supportive sports bra is a must to make your workout experience strong and less painful. While exploring your nearest lingerie store for this purpose you must get professional help to get a right size and try the suggested sports bra to find out whether they stay in its place while bending or jumping. This gorgeous looking Nike T-shirt with the running jacket and super comfy tights will make exercising great fun. You can make your appearance more smart and attractive by applying light foundation, a coat of waterproof mascara and neatly tied hair. 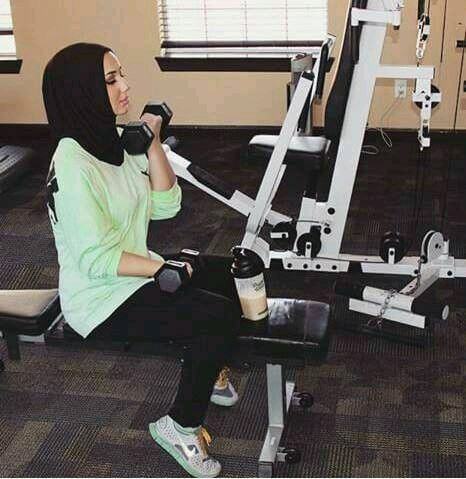 This modest gym attire bears a highly sophisticated look for Hijabis. It will not only be comfortable in carrying out the routine treadmill or lift weight workouts but also will not draw any negative or provocative attention towards you and you can carry out your exercises without worrying about anything. The cute teen, modest gym wear style is best to choose for various gym exercises. Wearing loose fitted shirt, you will be able to move freely and air can reach and dry the excess sweat from your body to make you stay cool. The color also does matter here. How! lighter colored gym wear will keep you cool in summer, while in winters, the dark colors absorb light and keep you warm. The lighter colored gym wear will keep you cool in summer, while in winters, the dark colors absorb light and keep you warm. For being fashionable and stylish, you don’t have to reveal your body! This amazing sportswear is one such example. According to your personality requirements, if you prefer the top which is loose and covers your body, this is a superb and Haute idea for you! The smoky leggings along with it will make the yoga and exclusive body workouts easy for you. The glamorous look while being in Hijab and gym wear is possible. Have a look at this modest yet highly functional workout dress! where do you get outfit #11 from?? ?